DNA, or deoxyribonucleic acid, is like a blueprint of biological guidelines that a living organism must follow to exist and remain functional. RNA, or ribonucleic acid, helps carry out this blueprint's guidelines. Of the two, RNA is more versatile than DNA, capable of performing numerous, diverse tasks in an organism, but DNA is more stable and holds more complex information for longer periods of time. A nucleic acid that contains the genetic instructions used in the development and functioning of all modern living organisms. DNA's genes are expressed, or manifested, through the proteins that its nucleotides produce with the help of RNA. The information found in DNA determines which traits are to be created, activated, or deactivated, while the various forms of RNA do the work. The blueprint of biological guidelines that a living organism must follow to exist and remain functional. Medium of long-term, stable storage and transmission of genetic information. Helps carry out DNA's blueprint guidelines. Transfers genetic code needed for the creation of proteins from the nucleus to the ribosome. Double-stranded. It has two nucleotide strands which consist of its phosphate group, five-carbon sugar (the stable 2-deoxyribose), and four nitrogen-containing nucleobases: adenine, thymine, cytosine, and guanine. Single-stranded. Like DNA, RNA is composed of its phosphate group, five-carbon sugar (the less stable ribose), and 4 nitrogen-containing nucleobases: adenine, uracil (not thymine), guanine, and cytosine. Adenine links to thymine (A-T) and cytosine links to guanine (C-G). Adenine links to uracil (A-U) and cytosine links to guanine (C-G). DNA is found in the nucleus of a cell and in mitochondria. Depending on the type of RNA, this molecule is found in a cell's nucleus, its cytoplasm, and its ribosome. Deoxyribose sugar in DNA is less reactive because of C-H bonds. Stable in alkaline conditions. DNA has smaller grooves, which makes it harder for enzymes to "attack." Ribose sugar is more reactive because of C-OH (hydroxyl) bonds. Not stable in alkaline conditions. RNA has larger grooves, which makes it easier to be "attacked" by enzymes. DNA is self-replicating. RNA is synthesized from DNA when needed. The helix geometry of DNA is of B-Form. DNA is protected in the nucleus, as it is tightly packed. DNA can be damaged by exposure to ultra-violet rays. The helix geometry of RNA is of A-Form. RNA strands are continually made, broken down and reused. RNA is more resistant to damage by Ultra-violet rays. DNA and RNA are nucleic acids. Nucleic acids are long biological macromolecules that consist of smaller molecules called nucleotides. 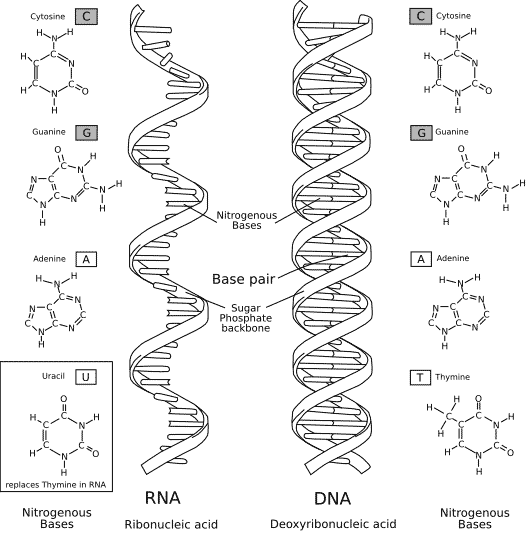 In DNA and RNA, these nucleotides contain four nucleobases — sometimes called nitrogenous bases or simply bases — two purine and pyrimidine bases each. Structural differences between DNA and RNA. DNA is found in the nucleus of a cell (nuclear DNA) and in mitochondria (mitochondrial DNA). It has two nucleotide strands which consist of its phosphate group, five-carbon sugar (the stable 2-deoxyribose), and four nitrogen-containing nucleobases: adenine, thymine, cytosine, and guanine. During transcription, RNA, a single-stranded, linear molecule, is formed. It is complementary to DNA, helping to carry out the tasks that DNA lists for it to do. Like DNA, RNA is composed of its phosphate group, five-carbon sugar (the less stable ribose), and four nitrogen-containing nucleobases: adenine, uracil (not thymine), guanine, and cytosine. RNA folding in on itself into a hairpin loop. In both molecules, the nucleobases are attached to their sugar-phosphate backbone. Each nucleobase on a nucleotide strand of DNA attaches to its partner nucleobase on a second strand: adenine links to thymine, and cytosine links to guanine. This linking causes DNA's two strands to twist and wind around each other, forming a variety of shapes, such as the famous double helix (DNA's "relaxed" form), circles, and supercoils. In RNA, adenine and uracil (not thymine) link together, while cytosine still links to guanine. As a single stranded molecule, RNA folds in on itself to link up its nucleobases, though not all become partnered. These subsequent three-dimensional shapes, the most common of which is the hairpin loop, help determine what role the RNA molecule is to play — as messenger RNA (mRNA), transfer RNA (tRNA), or ribosomal RNA (rRNA). DNA provides living organisms with guidelines—genetic information in chromosomal DNA—that help determine the nature of an organism's biology, how it will look and function, based on information passed down from former generations through reproduction. The slow, steady changes found in DNA over time, known as mutations, which can be destructive, neutral, or beneficial to an organism, are at the core of the theory of evolution. Messenger RNA (mRNA) transcribes genetic information from the DNA found in a cell's nucleus, and then carries this information to the cell's cytoplasm and ribosome. Transfer RNA (tRNA) is found in a cell's cytoplasm and is closely related to mRNA as its helper. tRNA literally transfers amino acids, the core components of proteins, to the mRNA in a ribosome. Ribosomal RNA (rRNA) is found in a cell's cytoplasm. In the ribosome, it takes mRNA and tRNA and translates the information they provide. From this information, it "learns" whether it should create, or synthesize, a polypeptide or protein. DNA's genes are expressed, or manifested, through the proteins that its nucleotides produce with the help of RNA. Traits (phenotypes) come from which proteins are made and which are switched on or off. The information found in DNA determines which traits are to be created, activated, or deactivated, while the various forms of RNA do the work. One hypothesis suggests that RNA existed before DNA and that DNA was a mutation of RNA. The video below discusses this hypothesis in greater depth. This 16 minute video completely made my 6 hour lecture come together! Now I TOTALLY GET IT!! Lightbulb! Thank you! The video is very helpful. Thank you! The chart language "A single-stranded chain of alternating phosphate and ribose units with the bases Adenine, Guanine, Cytosine, and Thymine bonded to the ribose. RNA molecules are involved in protein synthesis and sometimes in the transmission of genetic information." is wrong! It should have Uracil replacing the Thymine as the base bonding with adenine in RNA. You had it right in the language at the start of the article. Why does the change of sugar in the base ribose for RNA and deoxyribose for DNA cause the observed structural differences: RNA mainly single stranded (but can be double stranded), DNA mainly double stranded. Does the ribose destabilize double RNA stands? Or is it due to the uracil base?